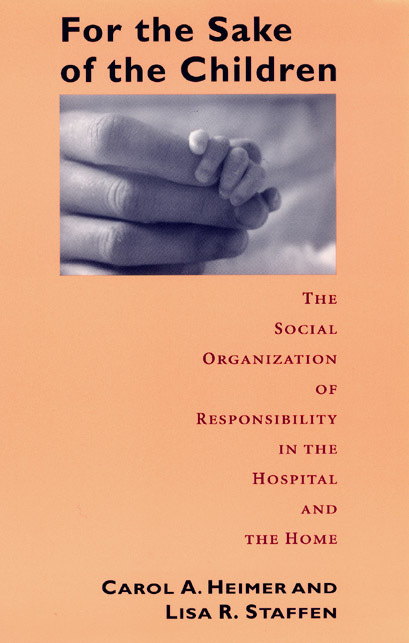 For the Sake of the Children examines the social organization of responsibility by asking who takes responsibility for critically ill newborns. Drawing on medical records and interviews with parents and medical staff, the authors take us into two neonatal intensive care units, showing us the traumas of extreme medical measures and the sufferings of infants. The accounts are by turns heroic and disturbing as we see people trying to take charge of these infants’ care, thinking about long-term plans, redefining their roles as adults and parents, and coping with sometimes awful contingencies. Rather than treating responsibility as an ethical issue, the authors focus on how responsibility is socially produced and sustained. The authors ask: How do staff members encourage parents to take responsibility, but keep them from interfering in medical matters, and how do parents encourage staff vigilance when they are novices attempting to supervise the experts? The authors conclude that it is not sufficient simply to be responsible individuals. Instead, we must learn how to be responsible in an organizational world, and organizations must learn how to support responsible individuals. 3: What Do We Mean by Responsibility?